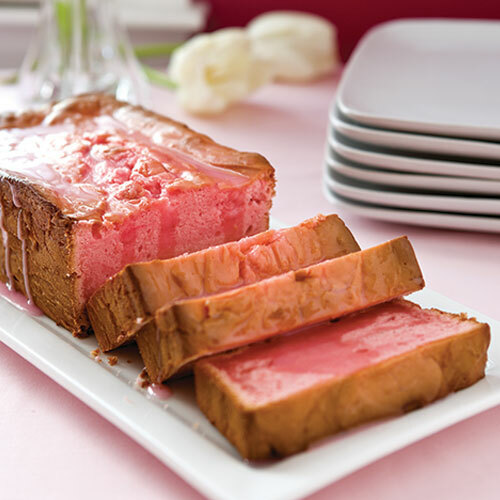 Is there a more perfect summer cake, than a Pink Lemonade Pound Cake? Make those summer days fade away with this recipe courtesy of Sandra Lee! Preheat oven to 350. Spray an 8-inch loaf pan with nonstick baking spray with flour. Line bottom of pan with parchment paper; set aside. In a large bowl, combine cake mix, sour cream, pink lemonade concentrate, drink mix, cream cheese, eggs, and vanilla. Beat at low speed with an electric mixer on low speed for 1 minute. Increase mixer speed to medium-high, and beat for 2 minutes. Pour batter into prepared pan, smoothing top. Bake for 1 hour, or until a wooden pick inserted in center comes out clean. Let cool in pan on a wire rack for 20 minutes. Remove from pan, and cool completely on wire rack.